Are you currently planning a commercial relocation, but find yourself contemplating on just how to go about doing it? Moving your office from one place to another can be a daunting task, with an unlimited list of things to do. Well, there is hope out there and ways to make this major move easier, but you will need to hire a junk removal company. Below you will discover more information on office clearance services and how it can help you. If you are going to purchase brand new furniture for your new office, you will be left with lots of junk. Removal companies are very skilled in their profession and know exactly how to clear and clean your old office space. The removal crew will come in and take all that junk away, so that you will not have to deal with it. You will be able to focus on more important tasks and you do not need to be present, when the crew is on the premises. If you are an environmental friendly individual, you will definitely want to recycle, as much of the junk as possible. Of course, if you have a large quantity of refuse and rubbish, you would need to spend hours, even days trying to separate the recyclables from the non-recyclables. Why spend your precious time doing this, when the removal crew will do it for you. Most rubish clearance companies spend extra time trying to recycle, as much refuse as possible. Some will even try to re-use the materials, so it not need to go to the landfill. If you prefer recycling over landfill, you may want to contact a company representative torequest information about environmental fees. Most removal companies do not tack these fees onto the original price, but it is best to know up front, in this case. Every company has their own business and operational practices, but all of them strive to follow the strict regulations set aside by the Dorset County Council, regarding waste disposal. If you find yourself pondering the company’s work practices, be sure to contact the company and speak with a supervisor or manager. This professional will be able to answer all of your questions and provide you with a step-by-step business plan. If you have a lot of office rubbish that needs attention, you will definitely need several crew members to get the job done, in a time efficient manner. Most removal companies work in pairs, but more removers can be added, if necessary. Always request a time schedule, especially arrival and potential departure time, before the move date. This will allow you to prepare for the event, just in case you need to give the crew access to the facility. You will find that the movers work in a time efficient manner, so they will be in and out, before you know it. When you find yourself in need of hiring an office clearance company, be sure to take the time to do thorough research on each prospect. Never hire any company that is uninsured orunlicensed, because it would be taking more risks than what is truly necessary. 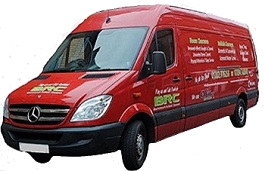 Here at BRC we have all the points covered, so when you're ready, make contact with us by calling the numbers above and below or send an email via our Contact page.